Social sweepstakes can be incorporated in a number of ways into your promotion. Whether it’s giving entrants an extra entry for sharing on Facebook and Twitter, or running an Instagram-based sweepstakes with a campaign hashtag, the possibilities are endless when you leverage the hottest new social channels. It may all be a bit overwhelming, but don’t worry, our social media team is constantly researching and staying up-to-date on the latest and most effective ways to integrate and/or feature social components into your next social sweepstakes or contest. 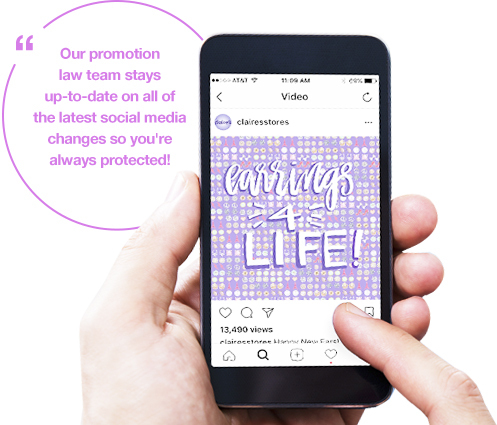 In addition to creating a strategic plan for your next social sweepstakes, we can develop the sweepstakes and capture data across any social platform. All of our mobile, social and SMS offerings still include our strategy, management, design, programming, legal and prize fulfillment services. Choose all of these services or just a few. It’s up to you!